How do I know if I'm using direct play, streaming, or transcoding? Direct play: Kodi plays the file, bypassing your Emby server. This can only happen if Kodi has access to the file via local/network. Direct stream: Emby server feeds the file as is to Kodi. There is no modification done to the file. Transcoding: Emby server feeds the file in a readable format to Kodi. This happens in the event Kodi doesn't support the file format you are trying to play. I've got Kodi set up with the Emby add-on at home. How do I know if playback is using Direct Play, streaming, or transcoding? When I'm playing something, I can see what looks like a buffer amount in the progress bar. Is there any way to know what method is being used within Kodi or within Emby server? Sorry if this is a noob question, I'm new to this setup. Adding to what null_pointer already mentioned. In your Emby server dashboard, under Active device, when Kodi plays something you can simply mouseover the Kodi device and it will tell you if it's Direct playing, Direct streaming or transcoding. Thanks for the replies! That's what I figured was happening. Now one last question - With Emby, what's the difference between streaming and transcoding? Edited by Angelblue05, 23 May 2015 - 12:09 AM. Excellent explanation! I assume pretty much the only time transcoding is done would be for things like playback via the web browser? Exactly, the only time you should see transcoding is if the format is not supported (web browser have limited support) and/or if you force it by lowering the Video quality. In Kodi, you should be able to play everything directly (there's very few things Kodi can't play). Is forcing a lower video quality now supported by the new Emby addon? Yes, just turn on the 'Play from HTTP instead of SMB' option, then you can select the bitrate. So when the Kodi PC is remote to the Emby server, the play from HTTP option should be used. In this situation the only items that transcoded during my tests were a DVD VIDEO_TS rip and a Bluray ISO rip. 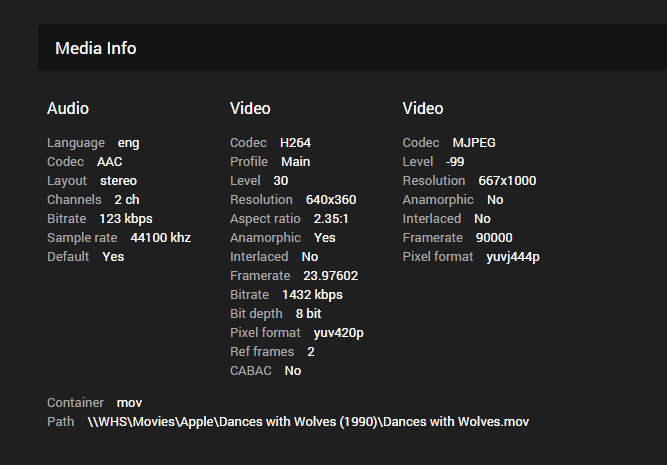 Everything else seemed to direct stream OK apart from .mov which it doesn't seem to like playing remotely. Can you try playing that .mov remotely through the web interface? OK this is one of the same .mov files we have talked about in other threads, "Aliens in the Attic" just tried to play it in the Emby web GUI in Chrome browser remotely as I'm at my parents house now. Its playing fine and Emby says its transcoding. However when playing this same movie in Kodi it starts to play but then pauses, press play again and it plays for a few seconds and then pauses again. The server says its direct streaming. So its still the same as before in Kodi when trying to play any .mov files. It has to do with Quicktime, maybe the fact that we use apple.com to detect if we should use the user agent should change to detect the type QuickTime (.mov)? Edited by Angelblue05, 27 May 2015 - 01:26 PM. Oh yeah - that is something for the trailers stuff I think. @im85288 - do we still need that? I just tried to play another .mov file in Kodi remotely, one which we have not tried before "Dances with Wolves" and that does the same starts to play for a few seconds and then pauses etc. So I would say probably all my .mov files are affected, I've not had one play OK yet. Looking at this title in the Emby web GUI in the media info section Emby is still showing two video sections, what did @Luke say? Something about it reading the embedded image..
Also other Apple formats / containers such as .m4v .mp4 play fine in kodi remotely and direct stream. Just .mov seem to be an issue. And is it expected that DVD VIDEO_TS rips transcode remotely in kodi? I don't know if the server can direct stream these formats (including blurays). I'm not sure how to support it. Edited by Angelblue05, 27 May 2015 - 02:05 PM. I can try this if you want? next time I am there. Yeah, give it a try when you get a chance. I don't think so, we used that if I recall correctly when streaming trailers. As we only support real local ones in this addon it should be safe to remove if it's causing any issues.